My header photo* shows adepts of the Chisti Sufi order celebrating with Qawwali singing at the shrine of Hazrat Nizamuddin Aulia in Delhi. I took the photo just before midnight during Ramadan; despite the late hour the temperature was still in the low 30s celsius with the very high humidity that precedes the monsoon, and covered heads and bare feet were de rigeur. Hazrat Nizamuddin Aulia's shrine is deep in a labyrinth of alleys in the Muslim enclave of Nizamuddin West where few occidentals penetrate; my photo below shows the approach to the shrine, an ambiance which Max Hole would doubtless describe as "unwelcoming". 'In the early 9th century, when the Muslim mystics organised their Sufi brotherhoods or orders, they adopted music as a support for meditation, as a means of access to the state of grace or ecstasy, or quite simply as "soulfood", in other words, something that would give new vigour to a body and soul tired by the rigours of the ascetic life. In Sufism the sama, (meaning literally 'listening'), denotes the tradition of listening in spiritual fashion to music, chanting and songs of various forms, all ritualised to a greater or lesser degree. The very meaning of the word sama suggests that it is the act of listening that is spiritual, without the music or poetry being necessarily religious in content'. Similarities between the thinking of Britten and the Sufis may not be a complete coincidence. As was described in Britten's passion for the East, the composer was influenced by the culture of Bali which he visited with Peter Pears in 1956. Although Bali is predominantly Hindu, there is a Muslim minority that practises a form of Sufism that has absorbed animist and Hindu practices. 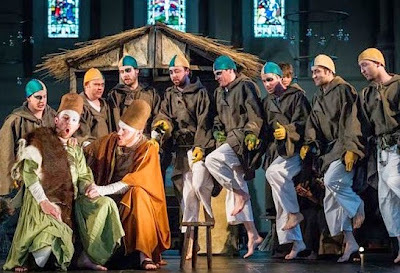 The photo below shows Mahogany Opera's production of Britten's church parable The Prodigal Son being performed in Orford Church as part of the 2013 Aldeburgh Festival. This shows how director Frederic Wake-Walker introduced Sufi symbolism into the staging: the pointed hats known as kûlah - which classical music's self-appointed gurus should note represents a tombstone for the ego - seen in The Prodigal Son staging are also worn by the Chisti Sheikhs in my header photo. But the point of this post is not to prove that Britten was a Sufi. Rather it is to draw attention to the advocacy by Britten and the Sufis of the lost art of listening. In his invaluable little book The New Religions philosophy professor Jacob Needleman describes how established religions have, to their cost, dispensed with esoteric technique, method, discipline and rituals in their frantic search for new congregations. In the same way, to its cost, established classical music has dispensed with esoteric techniques (music education), method (acoustic excellence and concert etiquette), discipline (preparation and effort on the part of the audience) and rituals (actually attending a concert) in its frantic search for new audiences. Can the the state of grace, the fusion between listener, performer and creator, that both Britten and the Sufis aspire to ever be accessed via a smartphone in an airport departure lounge? The stubborn refusal of classical attendances to grow in response to the multitude of initiatives that eliminate any effort from listeners suggests not. With streaming services such as Medici TV offering "Classical music to go... wherever you are in the world and at any time" received wisdom tells us that classical music should be in rude health. But the facts prove otherwise: for example, the Metropolitan Opera in New York, which is a leader in the cinema screeniing of opera simulcasts, has been locked in an acrimonious labour dispute at a time when, a to quote the New York Times" "finances are fragile as it grapples with weak box office sales". In the Guardian recently Tom Service endorsed the view of Paul Morley - whose credentials include successor to Max Hole as Association of British Orchestras conference speaker and Sinfini Music contributor - that: "Today’s era of technological fluidity, flexibility, and almost-instant access to an entire world of musical possibility suits classical musical culture better, potentially, than it does rock and pop". This view is shown by recent research to be at the best wishful and at the worst dangerous thinking. In May 2014 the results of research by English Touring Opera, the Guildhall School of Music and the Barbican into the impact of cinema screenings of operas on attendances at live opera were published; this research is, to my knowledge, the only objective study on this important topic. The main finding of the survey was that 85% of audiences that attend cinema screenings do not feel more compelled to see the live opera afterwards. 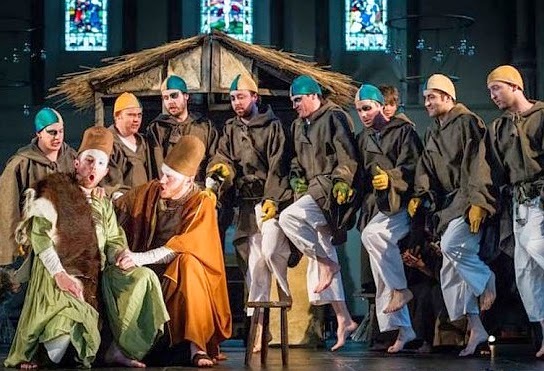 This conclusion prompted English Touring Opera’s general director James Conway to say: "A lot has been speculated about the potential for cinema relays to create new audiences for live opera. I would love that to be the case but, as this research indicates, it may be wishful thinking." If cinema screenings, with all the benefits of high definition visuals and full-range 5.1 surround sound, do not create new audiences for live classical music, what chance is there for the infinitely less engaging streaming to mobile devices? At least cinema screenings of opera do not devalue the art form by giving it away. But the latest craze of free streaming does. Does no one see the irony of industry pundit Norman Lebrecht aggressively promoting a special-offer advertising promotion for [free] live-stream performances"** while also lamenting that the best selling CD in the US sold just 175 copies in a week? There is no evidence that giving classical music away attracts a new paying audience, but there are good reasons to suggest free music simply attracts a transitory audience for free music. Britten was right when he told us music demands some effort from the listener - "a journey to a special place... saving up for a ticket..". Classical music to go and free streaming are just two symptoms of an artform-threatening oversupply epidemic, and the classical music industry needs to act quickly before it succumbs to what Kierkegaard described as 'the sickness of infinitude'. * All my photos On An Overgrown Path are taken on a Canon SX150 IS compact digital camera. I prefer this small and convenient camera over bulkier SLR models as it can be sliiped into a pocket and is ideal for discretely shooting the type of photo seen above - photography is not encouraged at shrine of Hazrat Nizamuddin Aulia. ** To avoid contributing to parasitic link-whoring the links in this post to Slipped Disc are deliberately indirect - the destination of the link should appear at the top of the Google search results. Photos 1, 2 and 4 are (c) On An Overgrown Path 2014. Any other copyrighted material is included as "fair use", for critical analysis only, and will be removed at the request of copyright owner(s). Also on Facebook and Twitter. As much as I enjoy your leisurely strolls through the aromatic gardens of classical music, or agree with your eventual diagnosis of the alchemy of "new" ideas (what, after all, is truly "new" under the sun, at this point? ), I must admit I chafe a bit at the lessons learned from religious studies, when applied to our beloved art form and pleasures. In my humble opinion, this is not a religion. I don't think it is necessarily helpful for humanity, nor does it make people do charitable things, nor do I necessarily want to put it on a pedestal for achieving more than its fair share. It's just a nice way to spend a few hours. "Classical music is just a nice way to spend a few hours". That doesn't sound like an art form to me. That sounds like an entertainment. Well sure, music is an art form, but who says it can't be entertaining? At least on some level.